I’ve been a pilot for over a half century now, and a water person longer than that. Getting long in the tooth on both. The latter is not so far distinct from the former as one who does neither, might imagine. The surf can be soothing or roiling, it is sustaining, and offers up glorious opportunities to ride its currents. Immersed within its embrace below the surface, a diverse world awaits to dazzle one with its immense diversity and sheer beauty. It’s just like the atmosphere—liquid in a vapor state (and sometimes a liquid state in the bargain). I’m here to tell you that flying is nothing like wielding a joy stick in a computer game—the atmosphere is alive and thrumming in your hands and against your rudder pedal feet, you can feel its energy as a dynamic force by which manipulating the controls produces changes in the aircraft attitude and direction. Exactly like dropping in on a pitching peak breaking at my favorite local reef—a little bend in the legs, and then off the bottom, a leg and upper back extension as the shoulders dip to drive the board off on a side rail in the direction of travel across the wave face. Energy imparted from the body and returned by the “atmosphere.” Lucky me, I get to revel in these experiences in both of earth’s fluid atmospheres. I check the waves daily, and when they fit my old guy parameters, I paddle out. I also watch the sky daily, and look for times that just call out to me to be soaring, untethered by the two dimensions that mostly constrain terrestrial life. And sometimes other opportunities present themselves to waft about in ways at once delightful per se, and altruistic. 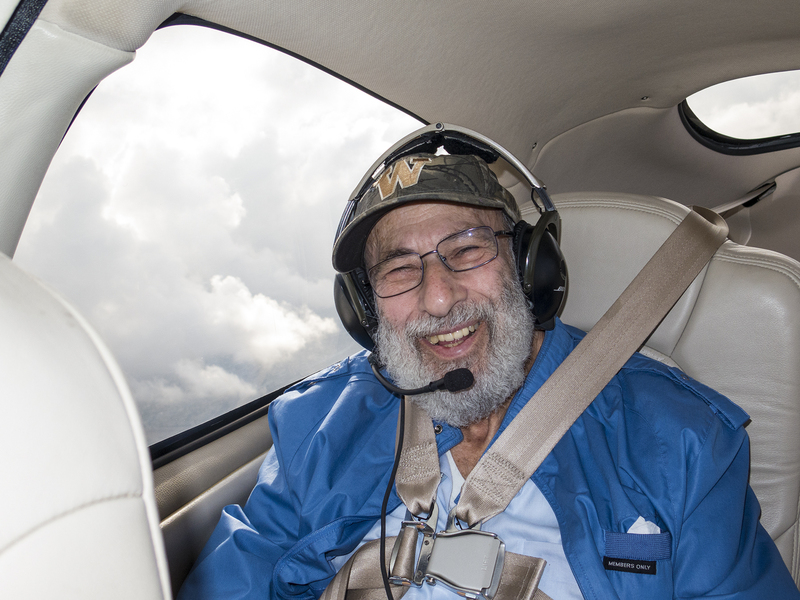 Let me introduce you to Angel Flight West, and what it does, by introducing you to Lawrence Greenberg. Lawrence and I are the same age, and he has me beaten, hands down, in the smile department. His grin is like a shaft of bright sunshine breaking out of the billowing clouds seen over his right shoulder as we cruise northwest in Cirrus N111TT. A lawyer by training, he has a keen mind, and a robust curiosity and interest in what is happening around him. He misses nothing, and knows how to engage with the moment or hold back as circumstances dictate. He has been fighting cancer for some time now, and is enrolled in a treatment protocol provided by a physician associated with UCLA. He has to get back and forth between his home in the San Diego area to Santa Monica for his treatments, and this is a challenge given the frequency of appointments, early morning times of treatment, the impact on the body for returns at the end of the day, and so on. Care providers and social workers are tuned into these necessities, and work to connect patients, support givers like those helping Alzheimer’s individuals, adults or kids with developmental disabilities, and other challenges with Angel Flight West, a non-profit based at Santa Monica Airport. 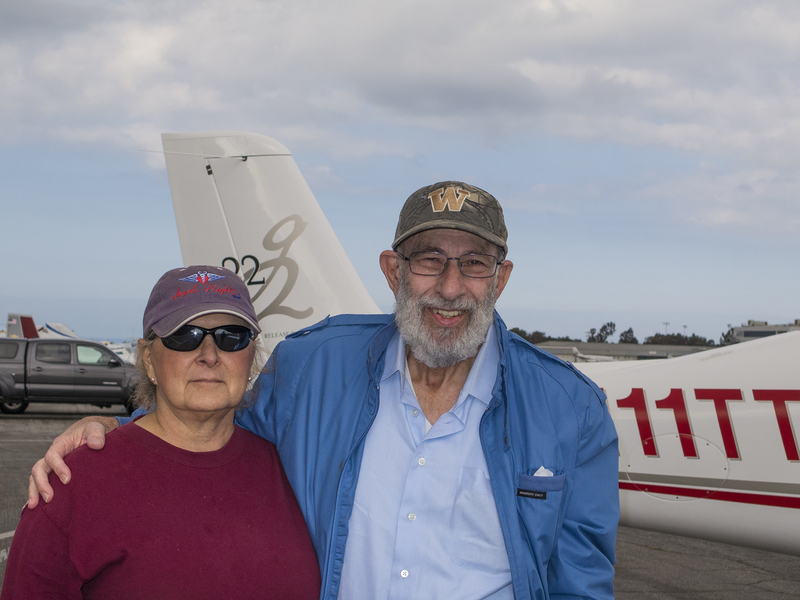 Angel Flight West http://www.angelflightwest.org coordinates those needs with pilots and surface transporters—known as Earth Angels—to get folks where they need to be. I am consistently impressed with the skill and efficiency of AFW staff in interfacing with need and opportunity, matching patients, pilots and planes for effective transportation. Even more so, I am humbled by the heart that AFW staff has for both those needing help and those providing it. This isn’t just a job for the staff, it is a calling, and they give it their all, gladly and consistently. I have had the honor of attending Celebration of Life services with AFW staff for patients who eventually were overcome by their illness—these people care, and all of us who use their service are individuals they know with surprising intimacy. AFW is a Non Governmental Organization, and the sort of service AFW provides just wouldn’t be the same consuming tax dollars with government’s one-size-fits-all functionality. Not to belittle government workers, but the spirit and sincerity of AFW is hard to replicate without the get-it-done heart and mentality of individuals like the staff at AFW. There’s a place for both in society, and AFW inhabits its place with a particular grace. AFW has developed web-based programs to keep track of need and opportunity connecting both sides of the equation, providing follow up and the other mundane but necessary aspects of care-giving, all of this overseen and kept humming by staff in their office a short amble from Santa Monica’s Typhoon restaurant. I get daily e-notes providing overviews of mission needs to which I can respond for when my operational opportunity aligns. On Monday I got such a note about yesterday’s Thursday travel need for Lawrence. A quick scan of forecasts on my pilot flight planning sites suggested this was a mission that could be completed with only minimal weather impact likely. I clicked on “Request this Mission,” and a couple of hours later was assigned to be Command Pilot to take Lawrence from my home base of Montgomery Field to Santa Monica. I followed up on the contact information and we agreed as to time and meeting place for a departure providing for his his early morning arrival up yonder. AFW likes to have Mission Assistants aboard flights, in case assistance underway might be needed, and while they also try to pair MA sorts with pilots, I often prefer to offer the position to one of my pilot chums, thus providing mission assistance and pilot redundancy at the same time, and oh, by the way, sometimes connecting future command pilots with an organization about which they had only maybe heard about before. For this mission, I was pleased to be assisted by local pilot Mason Bailey, with whom I have flown to places near and far. The three of us rendezvoused at Gibbs Flying Service and proceeded directly to my hangar, where I had the airplane at the ready, already preflighted and serviced. We loaded up and taxied out as call-sign Angel Flight 6520, aboard my Cirrus SR22. I had filed an instrument clearance for the cloudy, occasionally rainy morning the night before, and our clearance via the San Diego November Nine routing was enacted before launching straight out toward Mt. Soledad at the Pacific shore, then a turn northwest paralleling the coastline, in and out of cloud layers, detouring a little here and there around bigger billowing cumulus. Surfers, three, sweeping about the “white water.” SoCal TRACON (Terminal Radar Control, i.e., ATC) directed us into a Santa Monica left downwind between LAX and SMO, and called out a B777 crossing our path left to right ahead, and restricted above us. There it was a moment later as we both found a clear sky moment amongst the morning’s clouds. A few left turns later we were lining up with the final approach course just outside Century City’s high rises, and south of the famous Hollywood sign on the hill, although it wasn’t visible amongst the clouds. 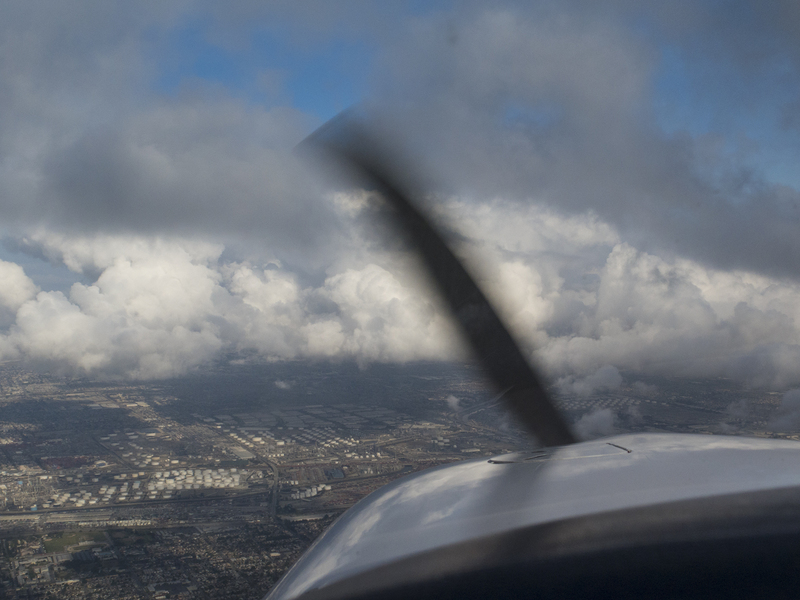 As we broke out of the clouds both laterally and vertically, the tower asked for reports on bases and tops to convey to other pilots, just as had Montgomery tower on our San Diego departure. Early birds like us are sometimes pathfinders for those keeping bankers’ hours. Forty-seven minutes after rotating aloft, I managed to find the ground with modest aplomb, more or less where I thought it and our main gear tires should be co-located, and we rolled out and decelerated. A left turn clear of the runway, and trundle via “Bravo” taxiway to a rock star parking spot before Typhoon’s front door. Earth Angel Margot Bernal was there and waiting for us as we deplaned. Morning greetings, all around, and Lawrence and Margot were off to his treatment center. Earth Angels like Margot are an essential part of this paradigm enabling that last leg of the journey from airport to treatment. I know from personal experience that Margot does this on a regular basis. Kudos. Meanwhile, Mason and I walked the fifty or so yards to the Angel Flight Office where I could introduce Mason to the folks that make it all work, and hopefully plant a seed for his future as an AFW pilot. Back on the ramp, we saddled up and taxied out for our takeoff from Santa Monica’s runway 21, departing via their quirky somewhat 270 degree turning departure to back overhead the runway and then via the Santa Monica November 22 routing back to San Diego’s Montgomery Field. 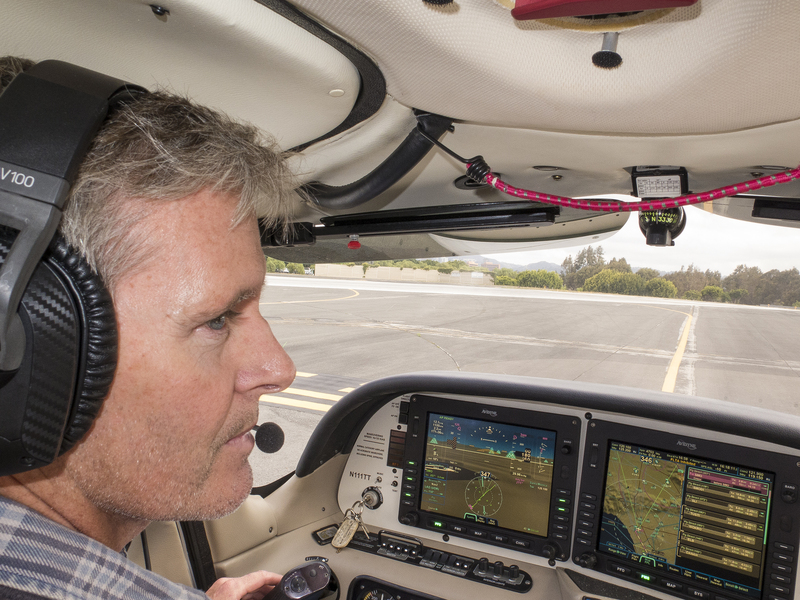 I used the opportunity to switch seats with Mason and give him the chance to see how the Avidyne Revision Nine avionics suite in our Cirrus differs from the Garmin-driven package in his Cirrus. Colleagues collaborating on things flight. An Area Navigation (GPS) approach back to Runway 28R, from which we had departed about two hours before, and back home for a dog walk and bike ride. Takeaways? It is an honor to have the opportunity, equipment and skill-set to give back to those with demonstrative need, and to be able to respond to coordination offers from Angel Flight West. Lawrence is a great guy, and his need is being answered by terrific people, and even a reprobate like me! At a personal level reflecting my specific quirks, I love the sky, I love the fluid dimension, and I love being able to share in all that with others, especially if it does some good in the bargain. I’m a lucky man. 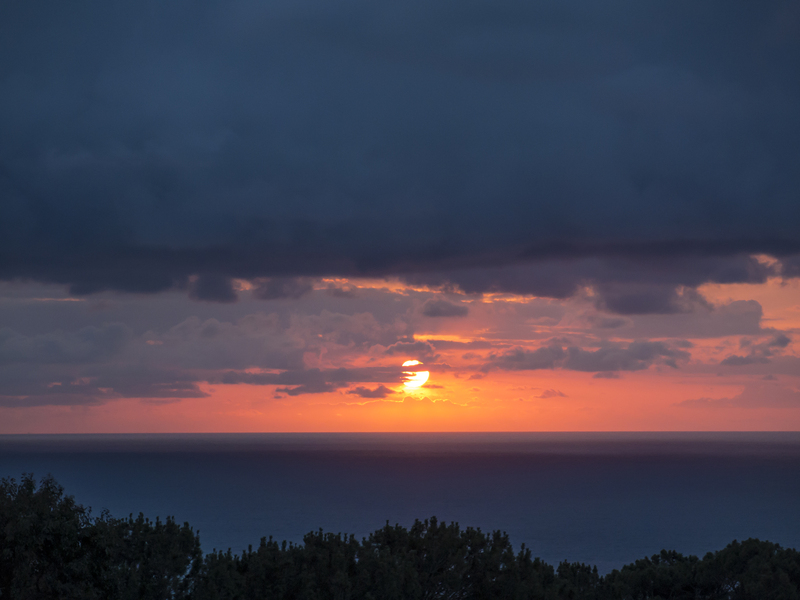 Oh, and because, as readers of this site have likely already discerned, if that day with the elements involves maybe a sunset amongst the clouds with the sky and the sea in attendance, it is icing on the cake. This is how yesterday ended up. 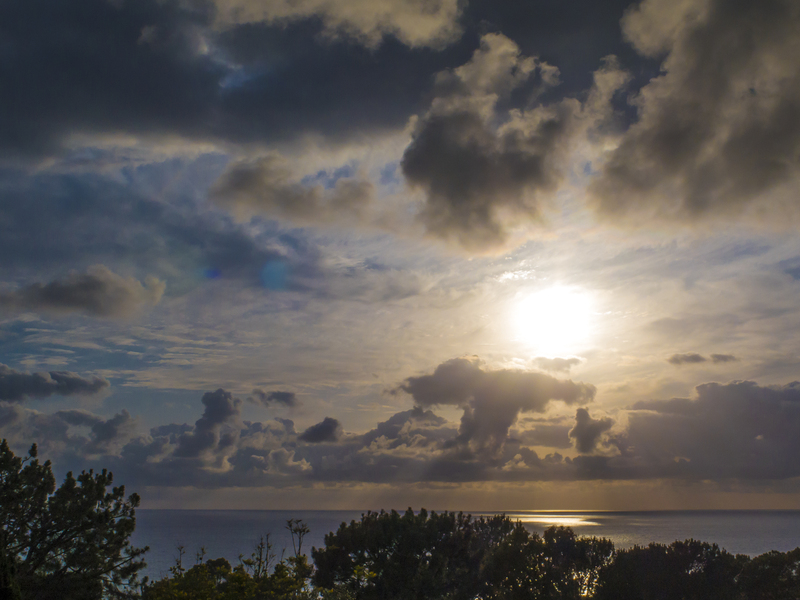 And, here’s a time-lapse view of this Thursday cloudset. As ever, your scribe, Thomas.